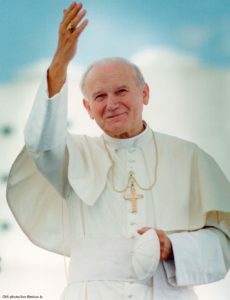 St. John Paul II launched World Youth Day in 1985. He welcomed the youth to Rome in 1986 for the first worldwide encounter. World Youth Day is celebrated every year in local areas, and every third year the event goes international bringing youth from all over the world together. The event targets young adults from ages 16-35, but all are welcome. The choice of Kraków as host city honors the memory of Polish St. John Paul II who lived there much of his life. It is also the first World Youth Day since St. John Paul II was canonized as a saint in April 2014. Pope Francis Plans to Visit Auschwitz on July 29 and will meet individually with ten Holocaust Survivors. The Pope will also meet with twenty-five “Righteous Among the Nations.” He plans no speech or large Mass at Auschwitz, and will instead enter solemnly, and visit Block 11. The killing wall stood between Block 10 and 11, where so many prisoners, including thousands of Poles, were executed by firing squad. July 29 also marks the 75th anniversary of the day St. Maximillian Kolbe the Germans condemned him to death by starvation. As a prisoner in Auschwitz, Father Kolbe exchanged places with a man condemned to die. He and the other ten men condemned were jailed in a dark, damp cell in the basement of Block 11. Every day he held Mass and held the men up in prayer. After two weeks, he was the last man alive. Today a custom security door stands in place of the heavy, wooden door that sealed the cell in darkness. The door allows visitors to peer into the cell. Blessed are the Merciful, for they shall receive mercy, Matthew 5:7 is the theme chosen for this year’s event. In the spirit of joy and celebration, here’s a fun clip of dancing nuns, getting in the spirit of World Youth Day. 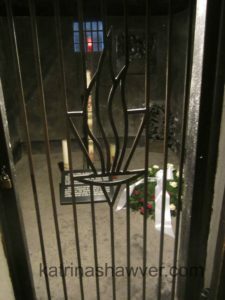 This entry was posted in Auschwitz, German Concentration Camps, Krakow, Notable Poles, Polish Current Events, Prisoners of Note and tagged Auschwitz, Krakow, Maximillian Kolbe by Katrina Shawver. Bookmark the permalink. Pope Francis has my blessing. I applaud the important actions and stances he’s taken. What a wonderful example and contribution to society. Thanks Kixx. I couldn’t agree more. Sorry I cannot attend! It would be inspriring. I agree! I can only imagine the positive energy all in one place.